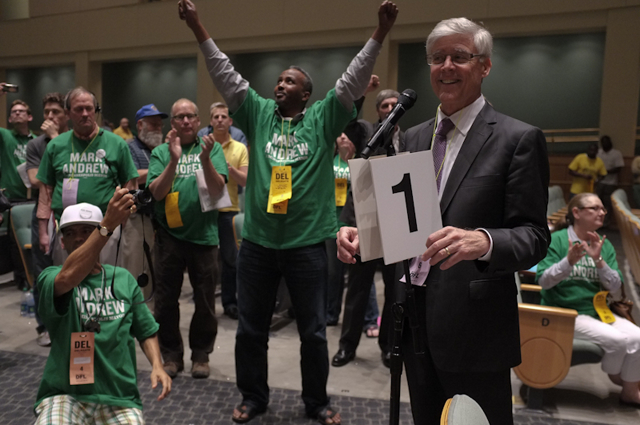 I had been saying for months that I doubted that there would be an endorsement for Mayor at this year’s convention since for the first time we will have Ranked Choice Voting in place for the general election. Even so, I decided to become a delegate and I was truly undecided when I arrived. My phone had been ringing off the hook these past weeks from the various campaigns seeking my support. I told each of them the truth that I was undecided. Endorsement is held sacred to the Party, but frankly the endorsement system is very broken and it was made painfully clear once again this year just how broken it is. Two years ago in the Governor’s race Mark Dayton knew they system was broken and ran against the Party’s choice winning first in the primary, then again to become Governor. Frankly I’m glad that this decision will be made by more people than the 1400 people who signed up to be convention delegates. Choice is a good thing. 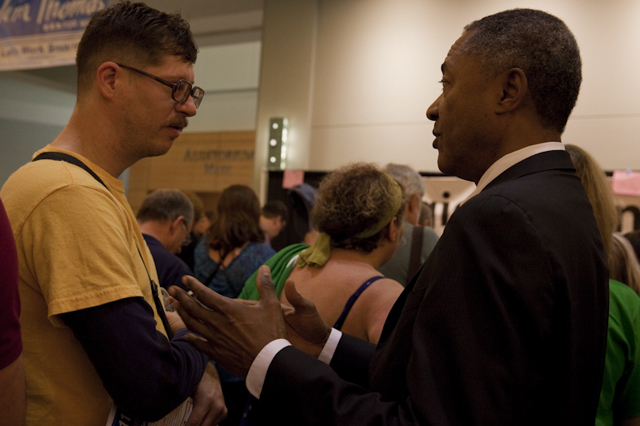 Don Samuels speaking to delegate Aaron Neumann. The day started out like any other convention with the candidates speaking to delegates in an attempt to win their backing. 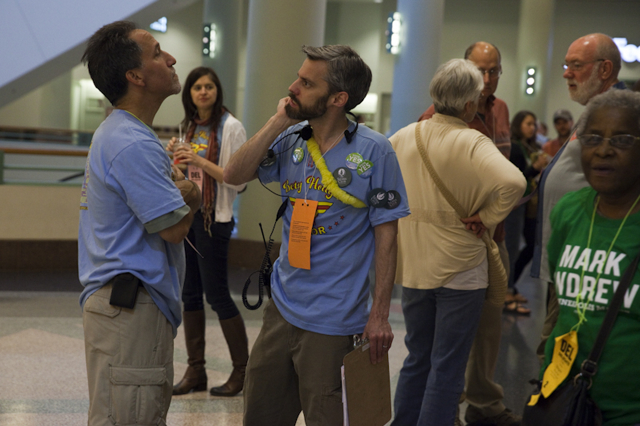 Mark Andrew speaking to a delegate. 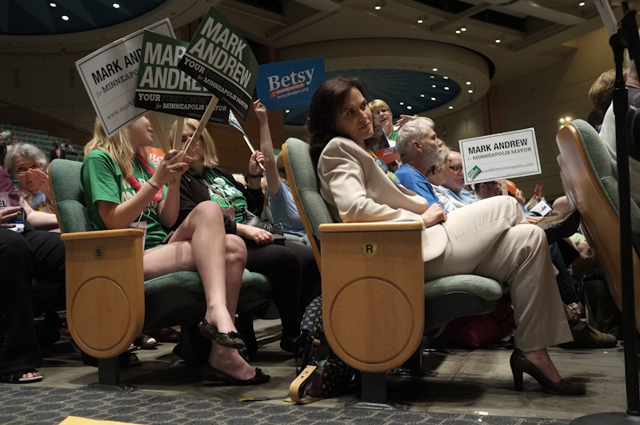 Conventional wisdom had Mark Andrew in the lead and it was said that he might have enough support to win endorsement. 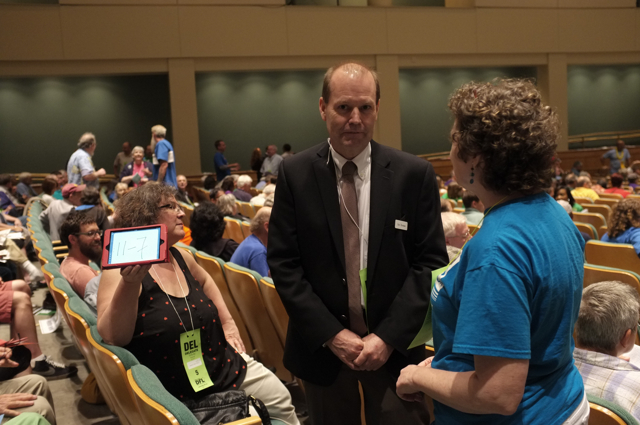 Gary Schiff speaking to a delegate. Gary Schiff was the only candidate who stated firmly all along that he would not run against an endorsement from this convention. 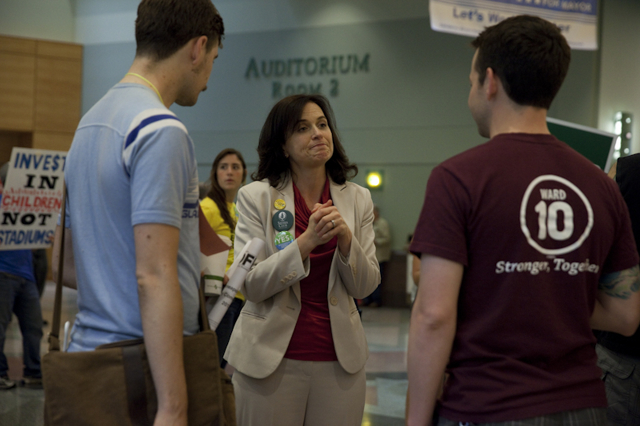 Betsy Hodges speaking to delegates. 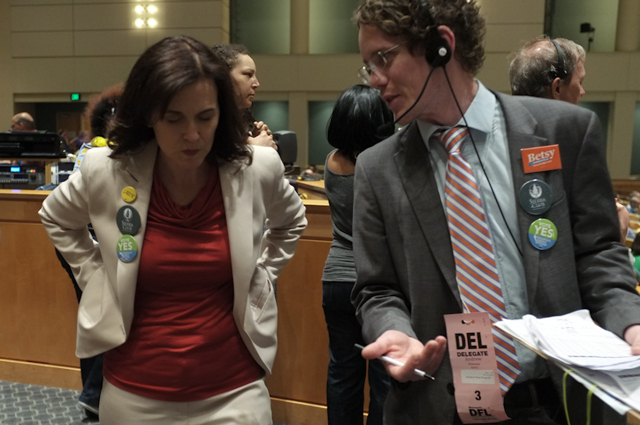 Yesterday during the Q&A Betsy Hodges said for the first time that she would abide by the Party’s endorsement. Jackie Cherryhomes, her husband F. Clayton Tyler and former Mayor Sharon Sayles Belton reacting to Jackie’s daughter Emma introducing her mother. Betsy Hodges also took a jab at both Jackie Cherryhomes and Mark Andrew when she said, “Will we go back to the 90s, when elected officials thought our city had so little to offer that people and businesses would only come here with a subsidy?” Jackie and Sharon both shot back at her saying they laid good groundwork for many things in the city. Jackie said she like everyone has made mistakes and she has learned from her mistakes. Finally at 3 pm the voting started. There were all the usual fights over rules and procedures that take time. Perhaps the time was needed to straighten out hundreds of delegates credentials that were messed up. A woman from my district waited for 110 minutes in two different lines before she was seated. Her name was first on the list from the Ward caucus. I got mine thankfully with a very short wait or I would have been extra grumpy if I would have endured that kind of a wait. 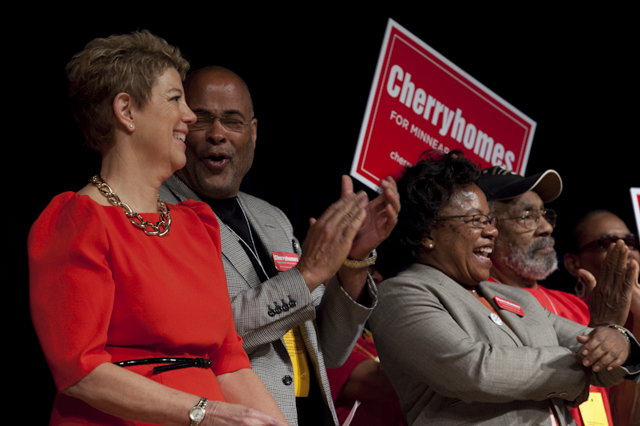 Jim Thomas, Jackie Cherryhomes and Don Samuels were all dropped after the first ballot for having less than 10%. 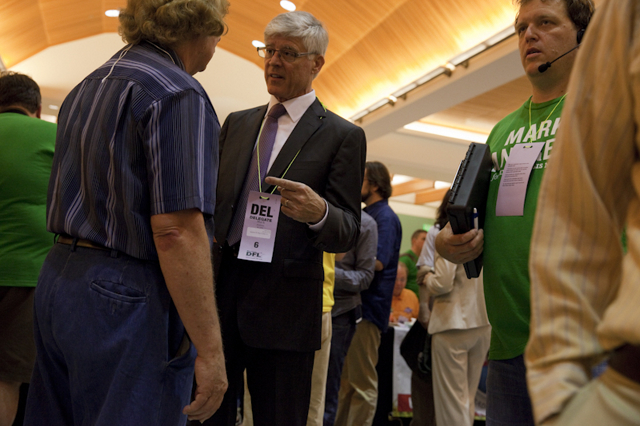 In between ballots the candidates cruised the floor and the hallways looking for undecided delegates and strategy planning was in a constant flow. Then the real action started when Gary Schiff asked to address the convention for one minute before the 3rd vote was cast. Since he was surrounded by the Hodges campaign it appeared that he would be dropping out to endorse Betsy. The Hodges and Shiff campaigns voting in favor of his request. The vote came in with the yes votes outnumbering the no votes, but not by a 2/3s majority so the motion failed. Gary stepped to the mike and said he was withdrawing his name from the next ballot and then held hands with Betsy at the front of the hall for all to see. 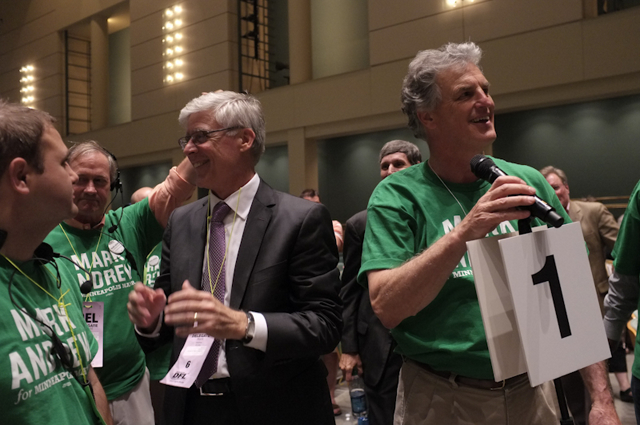 Gary held a press conference/delegate roundup outside the hall immediately after the vote to say he was still in the race and Betsy is his number 2 choice. His delegates chanted no endorsement! A few feet away the Firefighters Union to pulled their endorsement of Schiff and are now eagerly endorsing Mark Andrew. Senator Jeff Hayden also signed on to the Andrew campaign. Team Andrew had new momentum going into the 4th ballot. Russ Adams and Peter Wagenius from the Hodges campaign as we waited for the results of the 4th ballot. I have an idea…Let’s order pizza! Waiting for the results of the fourth ballot was taking FOREVER and Rick Stafford finally said there was questioning of the vote totals by one of the campaigns. Not sure how long much longer it would take. I heard word about pizza’s being delivered and that the Hodges campaign was walking out of the convention which would result in not enough people for a quorum. I got outside just as Betsy was addressing the delegates saying it was late, people had dogs they needed to let out, they were tired and hungry and this is not the way it should be done. 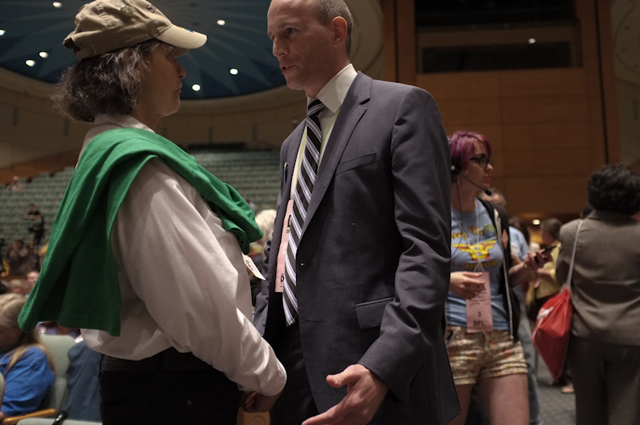 She said she knew people still had items inside the convention hall, but if they could wait a bit longer, (for the convention to end because of lack of quorum) it would be “safe” to go back inside to retrieve their items. Inside the hall the debate was raging over the quorum issue. It was clear to me there were not the over 700 people needed for that to happen. All one had to do was look at the numbers cast in the 4th ballot and see that unless over 100 Hodges people stayed and switched to Andrews, and all of the people who voted no endorsement suddenly switched to endorsing Andrew, there would not be enough. 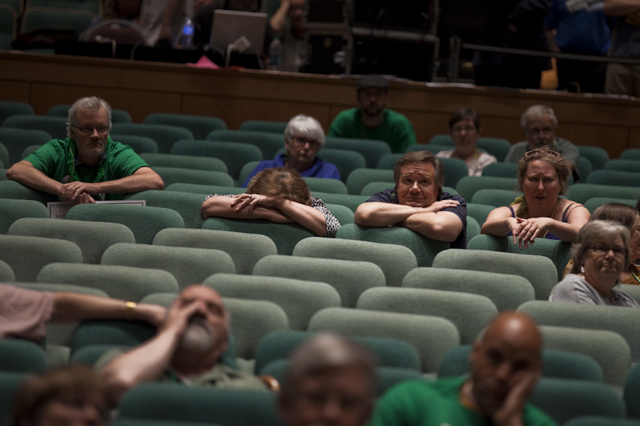 BUT, the delegates were told they had to stay for one last vote to make it official. They cast their votes but very few waited to see the result of the obvious. 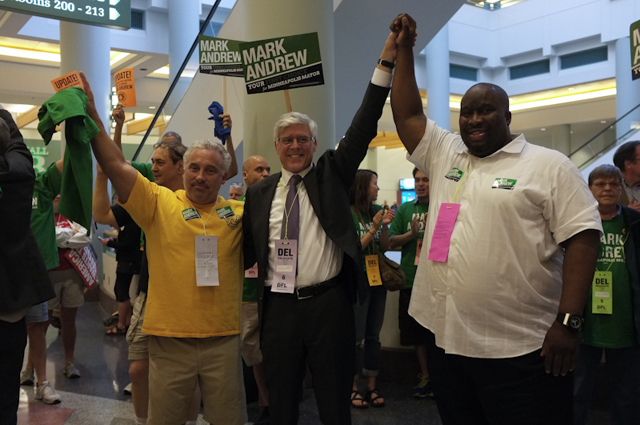 Mark Andrew ended up with 50.1% of the vote before the Hodges campaign left the convention. 60% is needed for endorsement. Generally when a candidate is dropping out, they are afforded the courtesy to address the convention. Bob Thomas asked when he was dropped and was voted down clear by a voice vote. Schiff’s request for one minute took nearly an hour for the convention to deny Schiff his time. Clearly Schiff’s endorsement of Hodges was a political maneuvering game to block the endorsement. In my opinion all unnecessary as there is no way there was going to be any candidate that would have reached the 60% needed. There had been an agreement that if no candidate was endorsed after 5 ballots, they rules said they could adjourn with no endorsement. We had been toughing it out for 13 hours, one more ballot, same results and less hard feelings. 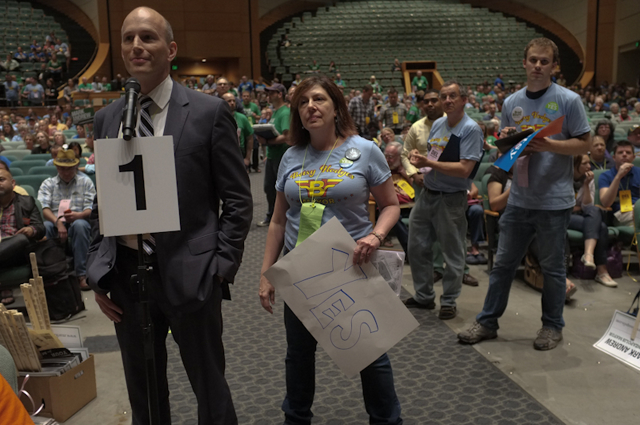 As a delegate who was there for 13 hours, it felt like an insult that one candidate decided part way through that she no longer liked the rules she had agreed to. 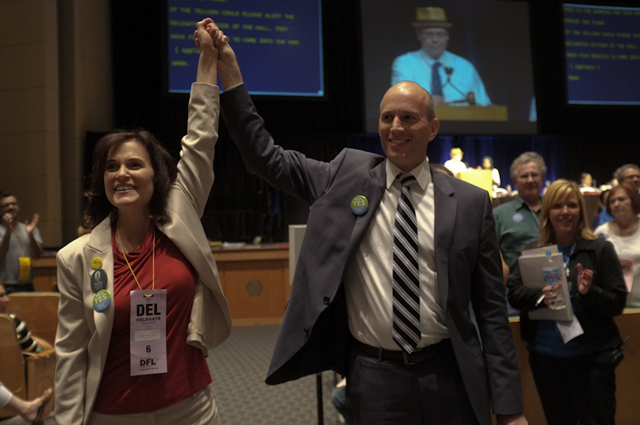 They could have come to the floor and made a motion to suspend the rules and end before the required 5 ballots, or have the delegates cast one last vote, but instead she turned heal and left. I too wanted to leave, get something decent to eat and go to bed, but I knew going in it was going to most likely be a very long day. Knowing this, I made arrangements to have someone take care of my dog for the day. 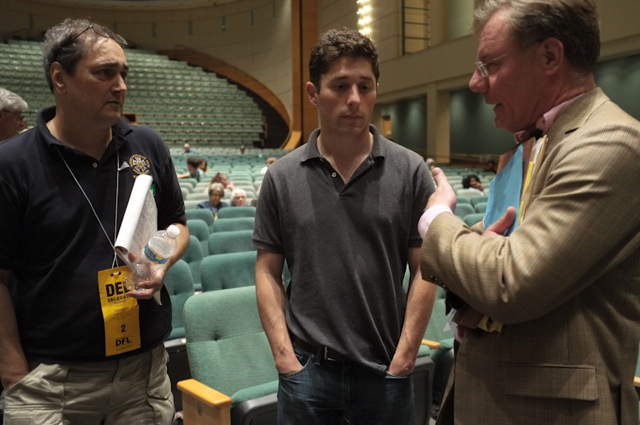 DFL endorsed Candidate Jacob Frey (center) 3rd Ward, was despondent about the lack of an endorsement. I am most sorry for the new delegates who did not have the years of experience of suffering through this chaotic display of democracy. Twenty years ago we went until 2 am for Sharon Sayles Belton’s endorsement. That also a result of one campaign dropping and endorsing Sharon putting her over Rip Rapson. I remember another State Convention in the 90s that went all night into the following day. Of course that was before RCV. RCV is a big game changer. 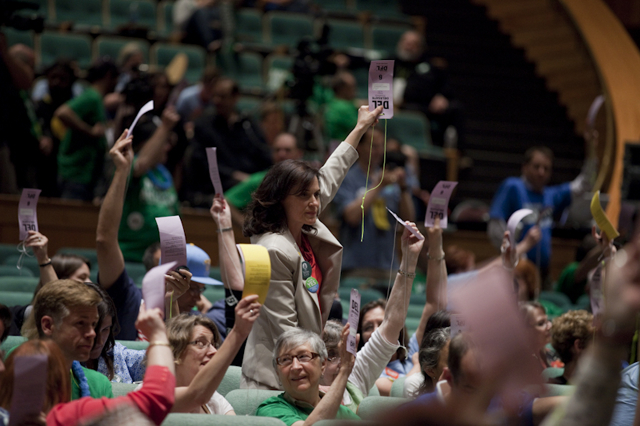 It’s time for the DFL to move with the change or be left in the dust of irrelevance. Terry, I agree totally. Was peeved as heck that after a 13 hour day there was a divisive walk out. No need for it! Even though Mark was ahead all day and gaining, it was obvious that we were headed for no endorsement. Betsy says she wanted to let her people go home, but her maneuver actually wound up taking more time, as we who stayed had to figure out the number for a quorum, entertain a few motions and so on. Meanwhile, her delegates who had left stuff in the convention hall couldn’t come back in to get it, so couldn’t go home anyway. I wish that she and Mark had come onto the floor together (Gary had withdrawn, so why was she hitching her wagon to that misguided star?) and called for adjournment together after that penultimate ballot. There could have been some semblance of unity and we would all have left feeling a tad better about the coming campaign. The walk-out felt like a big F-you to all of us who had stayed on in good faith. Hats off to the Hodges delegates who did NOT participate in the walk-out, btw. It also felt to me like her strategy was right out of Gary Schiff’s playbook. He needed there to be no-endorsement so he could continue his campaign. It didn’t feel like he was really endorsing Betsy, he was keeping Gary in the race. He even said, shortly after dropping out, that he was still running and that Betsy was his second choice. Welcome to Gary world. I think Betsy lost far more than she gained with this maneuver, and it was just so unnecessary. I don’t know anyone who left the convention feeling good about it. There need to be some big changes made, that’s for sure. But, I don’t get why you say RCV is a big game changer. At least not as far as this convention goes. I mean, it may well be one in the general election, but I’m not sure a good one. Some numbers whiz was running things by me last night in one of the interminable waits for ballot results and showed me how RCV could actually result in a new Minneapolis mayor named Gary Schiff. Honestly, I’d prefer a primary, and then another chance to vote between the two top contenders. I’m just not sold on the benefits of RCV in every election, especially in one-party town like this one. Great blow by blow and analysis I. The DFL caucus process is antiquated. 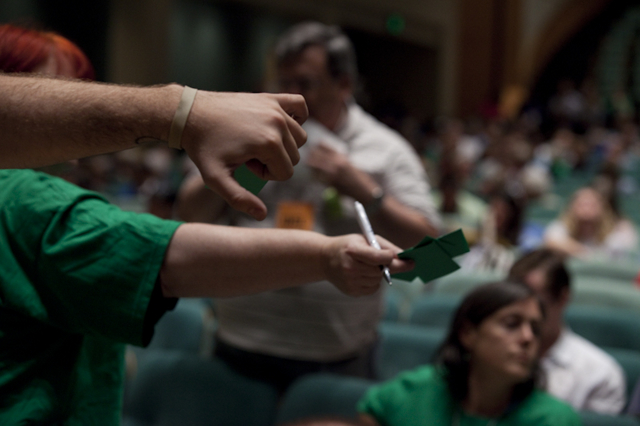 People had to write down names and addresses three times at our caucus – once on the roster, once on a slip of paper, then that was transferred by hand onto another list. Good grief. This is the 21st century: it’s high time they embraced technology! As to the convention: enough of this hand counting. 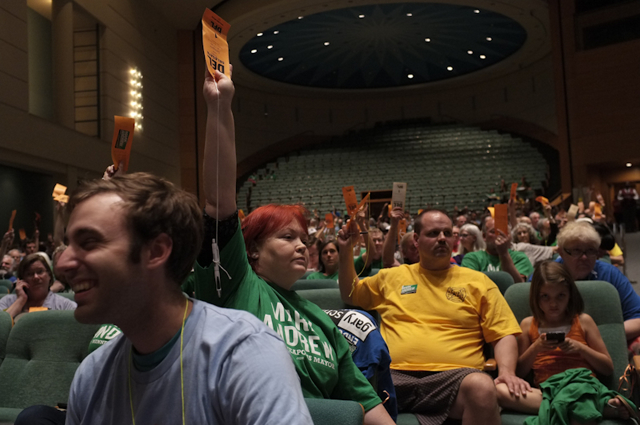 The DFL can figure out how to give delegates a PIN number, have them log in and vote. I would have preferred endorsement. However, this gives incumbents who did not win endorsement a leg up in the process (hence your final photo). Regarding the walkout: it did come across as disrespectful. As an underrepresented group, women candidates are not made stronger when they embrace the negative political campaign tactics of some male politicians; in fact, adopting heavy-handed moves of retribution and retaliation reflect badly on Hodges. They did not help her effort.